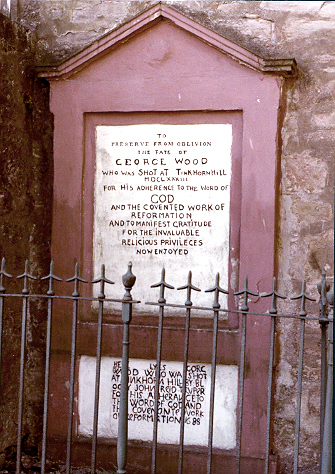 The gravestone to George Wood is located at the rear of Sorn church. The original stone and its replacesment have been built into the church wall. The beautifully-situated village of Sorn was an obscure hamlet in the days of the persecution, but the centre of a troubled district. A curate was settled in the church, in opposition to the people, who were exceedingly hostile to him, and were not slow in showing their resentment. A party of soldiers had a garrison in the place, and a noted persecutor resided in the neighbourhood, whose name lives in the traditions of the district as "bloody Reid of Daldilling." The site of his castle is still pointed out to the curious, as also the spot where his victims were hanged.